It had been many years since I had Western Food at Old Airport Road but I remembered that they marinate their chicken with honey and that is why the chicken has a sweet taste. True enough when the Chicken Cutlet came, the outer crust was nice and crispy and the chicken was sweet tasting like honey chicken. However, I find that the Chicken Cutlet was kindof oily and the chicken had some layers of fat and veins perhaps due to the fact that they used chicken tigh. 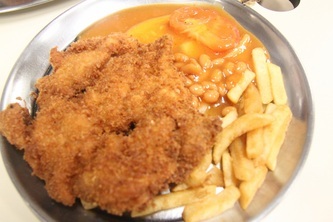 The Chicken Cutlet cost S$5.50 and the stall's name is Western Barbeque. Overall, I think that they have pretty good culinery skills, the doneness of the chicken was very good but it would have been better if it was not so oily. If you like your chicken sweet with a tinge of honey, this is one stall you can check out. I was at S-11 Food Centre today. I was contemplating between my old time favourite Western Food from this stall called Rasa Sayang Western Food and a bowl of Penang Prawn Noodles. I convinced my wife to share the food with me so that we could have both delicacies. This Western Food stall has gained lots of awards by the various variety shows like Yummy King. There were many people waiting for their takeaways and I decided to order a Fried Chicken Cutlet for S$6.00. The Chicken Cutlet is delicious and has a crispy breaded crust on the outside and the chicken is very tender on the inside. There are side dishes like the baked beans, garlic bread, salad and fries. Overall I find that the portion is generous and this is one of the better ones I have tasted. It has been a long time since I had a nice plate of Fish and Chips. 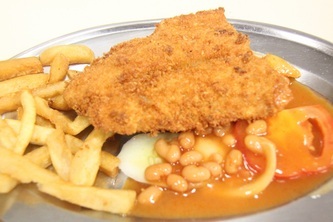 I heard that this stall at Toa Payoh called Wok Inn Fish and Chips serves very good Fish and Chips. I decided to check out this stall and when I was there I noticed that most of the people at the coffeeshop were either waiting with the number tag on the table or eating Fish and Chips. I ordered the Fish and Chip for S$5.80 and I was given a number tag as well. After waiting for about 15 minutes, the dish was finally served. The Fish and Chips looked delicious and true enough, the outer crust was fried till golden yellow on the outside and the fish was nice and fresh on the inside. The batter was thin and nicely coated onto the fish, making the fish nice and juicy. For the price and quality of the food, it was certainly value for money. If you have craving for Fish and Chips, this is definitely one that can satisfy you at cheaper prices. Today, I was at Tanglin Halt Food Centre to check out what good food I can find here. When I was there, I noticed the long queue at this No. 1 Western Food stall. I saw an oid man grilling and frying at the stall while his wife was taking orders from the customers. I went around to check out what most people are ordering from this stall and discovered that most people ordered the Chicken Cutlet. I ordered the Chicken Cutlet and Fish and Chips. The Chicken Cutlet was fried till it's nice and crispy. The Fish and Chips was also very crispy on the outside but very tender and fresh on the inside. They have also added the Hainanese style tomato sauce to both dishes so that it will not be too dry. 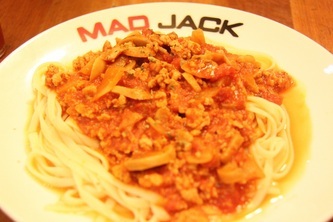 Today I was at Bukit Timah area and decided to stop at Mad Jack Cafe for dinner with my wife. It's a nice place that serves western food at pretty reasonable prices. We ordered Spaghetti Chicken Bolognaise* and Crazy Chicks and Chips as well as the brownie with vanilla ice cream with chocolate topping. The Pasta is a little overcooked and too soft for our liking. The sauce is not thick enough but I must say that they are quite generous with the minced chicken. 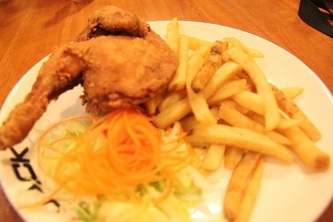 The Fried Chicken is pretty good, the skin is nice and crispy and I like the idea of adding fruits such as apples and peaches to the salad, making the dish a healthier choice. 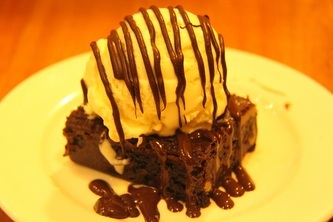 The brownie is very chewy and goes well with the vanilla ice cream but I find that the brownie is a little too sweet. The total price for 2 cost about S$28+ including drinks and deserts, pretty reasonable for 2 persons. Let the food detective bring you the best food recommendations!